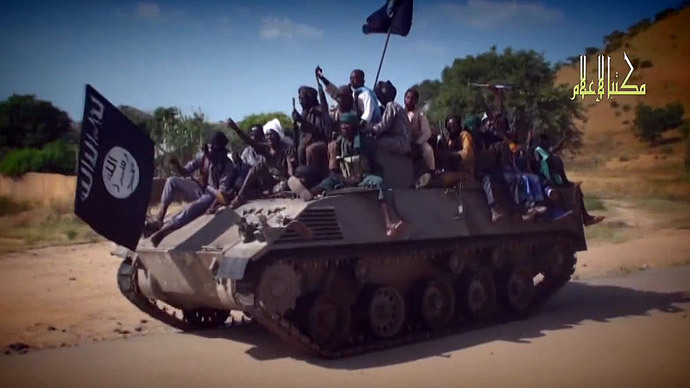 Boko Haram has been using children as “human bombs” and “expendable cannon fodder” in its heinous terrorist activities as well as enslaving girls and women, a UN official has reported to the UNHRC. “Bodies of children around 12 years old have been found strewn across such battlefields,” the United Nations human rights chief Zeid Ra'ad Al Hussein said at the UN Human Rights Council session in Geneva. Zeid told the Council that his knowledge was based on reports about Boko Haram using children as its first line of attack, as “expendable cannon fodder” that his office received. “The group has also repeatedly used young children as human bombs, including a case of a 14-year-old girl carrying a baby on her back who detonated a bomb in a marketplace,” Zeid said as cited by Reuters. He went on to say that abductions of both children and adults have been happening on a massive scale. Citing reports from witnesses and survivors, Zeid said that women and girls have been enslaved and subjected to sexual violence, forced labor and compulsory conversion. Boko Haram militants killed their so-called “wives” – women and girls they held as slaves – and other captives while retreating as military offensives by Nigeria and its neighbors advanced, UN human rights chief said. Moreover, Zeid said, he was informed that the security forces of Nigeria and other nations combating the insurgency have also allegedly been involved in human rights violations. “Such violations intensify the suffering of the people–and...this can only create resentment, facilitate recruitment of new insurgents, and foster vicious cycle of greater extremism,” Zeid said as he urged a thorough investigation. The Council condemned “the heinous terrorist activities of Boko Haram,” and insisted that those responsible for the crimes should be brought before courts of the affected states and held accountable. Besides endless violence, local people faced severe food shortages, as insurgency in the region also damaged farming activity. “Because the farms of northern Nigeria provide produce across the Sahel, this also means that the price of several basic foods has risen sharply across the region,” Zeid told the Council. Inspired by the current dry season, Boko Haram increased incursions into neighboring Cameroon, Chad and Niger, turning a localized crisis in region-wide massacre. “What was initially a localized crisis is fast growing to very disturbing regional dimensions,” he added. Last week Boko Haram extremists reportedly kidnapped more than 400 women and children from the Nigerian town of Damasak, which was freed on March 17 by Niger and Chad troops. Over the last six years, Boko Haram has killed more than 13,000 people in an effort to establish an Islamic caliphate in northeast Nigeria. Boko Haram started its insurgency after an uprising in 2009, when they began carrying out massacres, kidnappings and raids. Nearly 300 schoolgirls were abducted by Boko Haram in the town of Chibok last April, causing international outrage and attracting global attention to their six-year insurgency. The group has recently pledged allegiance to the Islamic State jihadist group in Syria and Iraq.